North Strathcona, including Powell Street Area (Nihonmachi, or ‘Japantown’), is the site of Vancouver’s earliest beginnings and a place that was an ancient indigenous seasonal camp. 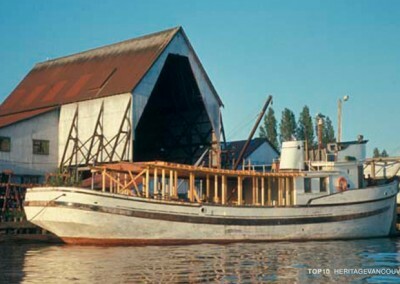 As a settlement and waterfront industries grew up around Hastings Mill, Japanese immigrants were attracted to the area. 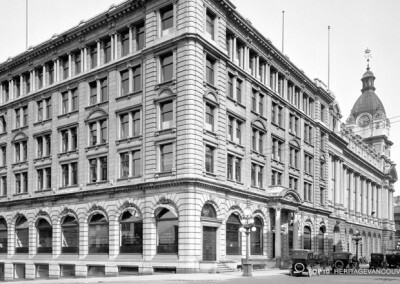 By the early 1890s, Powell Street was a flourishing mixed-use area where Japanese-Canadians owned buildings and businesses. 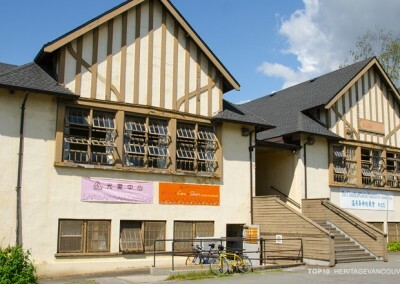 By the early 1920s, most of Vancouver’s Japanese and Chinese residents lived in walking distance of “Little Toyko” along with Yugoslav-, Scandinavian- and Afro-Canadians. The social and cultural fabric of Powell Street area was devastated in 1942, when the Federal Government forced Japanese-Canadians to leave the West Coast for internment camps in the British Columbia Interior, and Alberta, and seized and sold their private property. They were not legally allowed to return to Vancouver, or anywhere on the coast, until 1949 and many lost everything. These events, along with a decline of waterfront industries, such as canneries, and City decisions to rezone Powell Street Area to industrial use and otherwise discourage homes and businesses in what was seen as a “slum”, were all major factors behind the building decay and vacancies in the area today. Despite physical decline in Powell Street Area, an important number of historic buildings still remain. 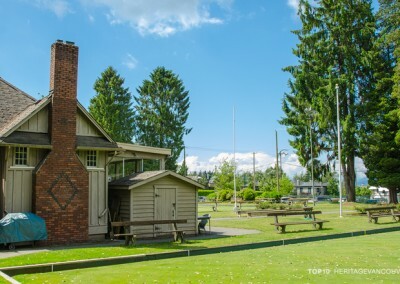 Some are listed on the Vancouver Heritage Register. Examples include the Japanese Hall, at 475 Alexander Street and the Firehall Theatre, at 80 East Cordova Street. However, few of the buildings on the Heritage Register are protected through designation, and dozens of others are not included at all, such as the cluster of 1911-1912 buildings on the 500 and 600 blocks of Alexander Street, where the Red Light District once thrived. The Thomas Dunn Residence, 255 Dunlevy Avenue, was built in 1886-87 and possibly the oldest house in the city, is not listed on the Heritage Register. The historical, social and cultural value of Powell Street Area to Vancouver, British Columbia, and Canada, is deeply tied to the Japanese-Canadian community, not least the injustices of internment and forced loss of property, as well as its indigenous heritage, and diversity within the community. Individual sites in this historic district, and the heritage urban landscape as a whole, continue to be vulnerable to redevelopment pressure. Vancouverites risk losing not only built heritage, but also the irreplaceable value of the visual memory and stories of the Japanese-Canadian community. Heritage Vancouver supports the recognition of Powell Street Area through the addition of sites that are individually significant to the Heritage Register, and the protection of Nihonmachi as a heritage urban landscape through the creation of a ‘Japantown’ Heritage Conservation Area. What is the threat to Powell Street Area (Nichonmachi)? North Strathcona, including Powell Street Area (Nihonmachi, or ‘Japantown’), is the site of Vancouver’s earliest beginnings and a place that was an ancient indigenous seasonal camp. Individual sites in this historic district, and the heritage urban landscape as a whole, continue to be vulnerable to redevelopment pressure. Vancouverites risk losing not only built heritage, but also the irreplaceable value of the visual memory and stories of the Japanese-Canadian community. Powell Street Area is located within the north end of the historic boundaries of Strathcona neighbourhood. The area is broadly bounded by Gore Avenue to the west, Alexander Street to the north, Heatley Avenue to the east, and the lane north of Hastings Street to the south. Some buildings in Powell Street Area are listed on the Vancouver Heritage Register. These include: the Japanese Hall, at 475 Alexander Street; the Coroner’s Court (Vancouver Police Museum), at 238-240 East Cordova Street; the Firehall Theatre, at 280 East Cordova Street; St. James Church and Rectory, at 303 East Cordova Street; and St. Luke’s Home, at 309 East Cordova Street. However, only a minority of buildings on the Heritage Register are protected by designation bylaws, and others are not included, such as a cluster of 1911-1912 buildings along the 500 and 600 blocks of Alexander Street, where the Red Light District once thrived. Of the buildings that remain, and are known to have been brothels, 500 Alexander Street is protected, but 504, 514, 610, 662 and 666 Alexander Street are not officially recognized as significant, and should be added to the Heritage Register; 514 Alexander Street is currently boarded up and vacant. One issue for the future of the Powell Street Area is the heritage-friendly zoning in Strathcona south of Hastings Street that is not available north of Hastings Street. Vancouver’s first zoning bylaw allowed the area between Dunlevy to Clark to be zoned for six-storey industrial buildings. This led to “urban blight” which the City attempted to remove through wholesale demolition of Victorian and Edwardian houses in the neighbourhood and construction of social housing in new towers. When its “urban renewal” efforts failed, the City elected to support the retention of the houses below the alleyway south of Hastings through the new RT-3 Zone. 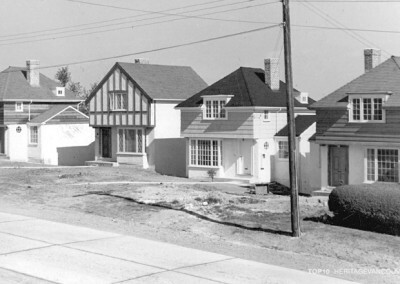 No protective zoning was given for houses or smaller buildings to the north or along Hastings Street. This East End neighbourhood has suffered from the absence of co-ordination in community planning. While Strathcona south of Hastings Street has undergone carefully-managed change, north of Hastings Street is subject to redevelopment. 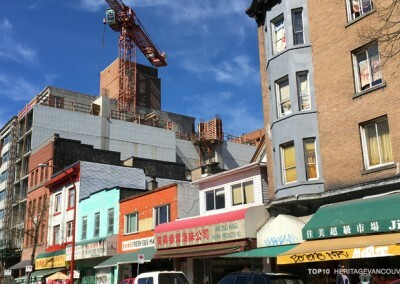 Though the “Downtown Eastside Plan” has a policy to consider a Heritage Conservation Area for Japantown, heritage sites throughout the area bounded by Main Street, Hastings, Heatley Avenue, the Port and the CPR tracks face the threat of demolition. Why is Powell Street Area (Nichonmachi) significant? Known as “Vancouver’s first neighbourhood”, Strathcona, including Powell Street Area, lies on unceded Coast Salish territory, and was built on ancient Salish sites, possibly 3,000 years old, along the south shore of Burrard Inlet. The seasonal site of Q’umq’umal’ay’ (“Big Leaf Maple Trees”) included the area at the intersection of today’s Hasting Street and Dunlevy Avenue, and was declared Crown lands after the colony of British Columbia was created in 1858. This land soon became a European logging camp, and then Hastings Saw Mill in 1867. North Strathcona grew up around Hastings Mill and other waterfront industries that from their beginnings attracted Japanese immigrants. By the early 1890s, Powell Street was a flourishing mixed-use area where Japanese-Canadians owned buildings and businesses with storefronts and community services at the street, and affordable rental accommodation above. The Powell Street Area is significant for a rich diversity of people and cultures then and now. 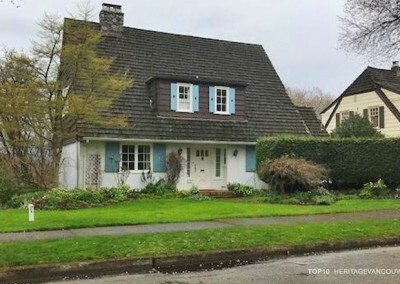 By the early 1920s, most of Vancouver’s Japanese and Chinese residents lived in walking distance of “Little Toyko” and Yugoslav-, Scandinavian- and Afro-Canadians lived here. First Nations had been dispossessed of their ancestral land through colonization, but worked alongside people from all these cultures in waterfront industries, and bought their fishing supplies and rented housing from Japanese-Canadian owners of buildings and businesses along Powell Street. Originally called Powell Street Grounds (Paueru Groundo), Oppenheimer Park was – and remains – at the heart of this diverse community. The renowned Japanese-Canadian Asahi baseball team, declared a National Historic Event in 2011, called the park home. This was the only place where the City permitted public protests, and many large crowds gathered fighting unemployment, poverty and racism. During the Great Depression, 1,000 homeless people were encamped in the blocks surrounding the park. The social and cultural fabric of Powell Street Area was devastated in 1942, when the Federal Government forced Japanese-Canadians to leave the West Coast for internment camps in the British Columbia Interior, and Alberta, and seized and sold their private property. They were not legally allowed to return to Vancouver, or anywhere on the coast, until 1949 and many lost everything. These events, along with a decline of waterfront industries, such as canneries, and City decisions to rezone Powell Street Area to industrial use and otherwise discourage homes and businesses in what was seen as a “slum”, were all major factors behind the building decay and vacancies in the area today. Despite physical decline in Powell Street Area, an important number of buildings still remain. Anchoring one corner of Oppenheimer Park is the landmark Tamura Building (Townsend & Townsend, 1912-1914, 394-396 Powell Street), known also as the New World Hotel. Along the 400-block of Powell are remarkable two-storey wood ‘boomtown’ frontages similar to buildings in early Gastown and Chinatown, all destroyed in the great fire. The 200-block Jackson Street has a cluster of early houses that frame the east side of the park, and on its south-west corner is the Thomas Alexander Dunn Residence, at 255 Dunlevy Avenue, possibly the oldest house in the city. The historical, social and culture value of Powell Street Area to Vancouver, British Columbia, and Canada, is deeply tied to Japanese-Canadians, not least the injustices of internment and forced loss of property, as well as its indigenous heritage, and diversity within the community. 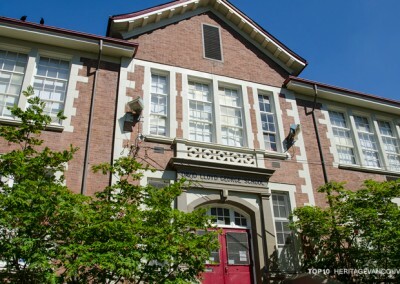 This historic district, and individual places and spaces within it, are significant for association with the past, and their continued use for cultural activities, such as classes in the Japanese Language School (487 Alexander Street), and the annual Powell Street Festival in Oppenheimer Park. Additionally, the 500 and 600 blocks of Alexander Street are important for the Red Light District that also existed here from 1911 to 1914. Brothels were found in apartments and houses in this two block area; those that survive are at 500, 504, 514, 610, 666 and 662 Alexander Street. Remarkable for the era, women were the owners of almost all of these buildings and businesses for this brief period. 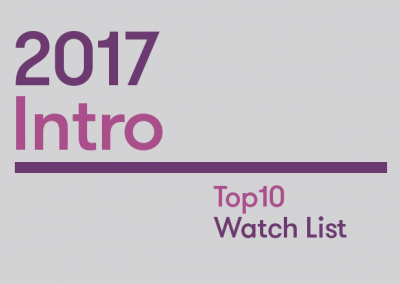 Creates a clear vision for the Strathcona neighbourhood, one that reintroduces the integration of Strathcona north and Strathcona south. Creates a ‘Japantown’ Heritage Conservation Area, and considers its expansion to protect an historic district of Strathcona north of Hastings Street. Extends RT-3 Zoning to help protect historic buildings north of Hastings Street in the same way as Strathcona south of Hastings Street. Write a letter to Mayor and Council to act on the recommendation in the Downtown Eastside Plan and the Heritage Action Plan to create a ‘Japantown’ Heritage Conservation Area, and to suggest that individual sites be added to the Vancouver Heritage Register. 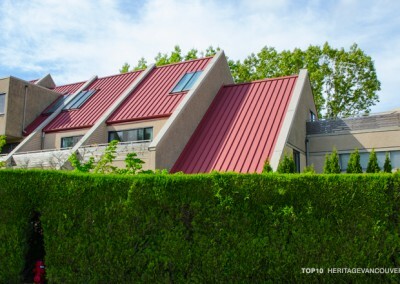 Support the recommendations of the Heritage Action Plan, including the Heritage Register Upgrade that recommends many of these buildings for inclusion on the Vancouver Heritage Register. 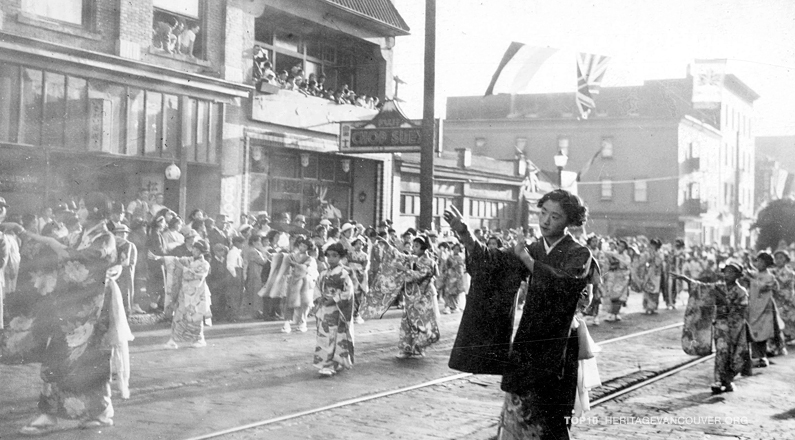 Help to raise the profile of Powell Street Area (Nihonmachi) as a historic district that is significant for Vancouver, British Columbia, and the whole of Canada.